Something cute and creative to kick off your week! 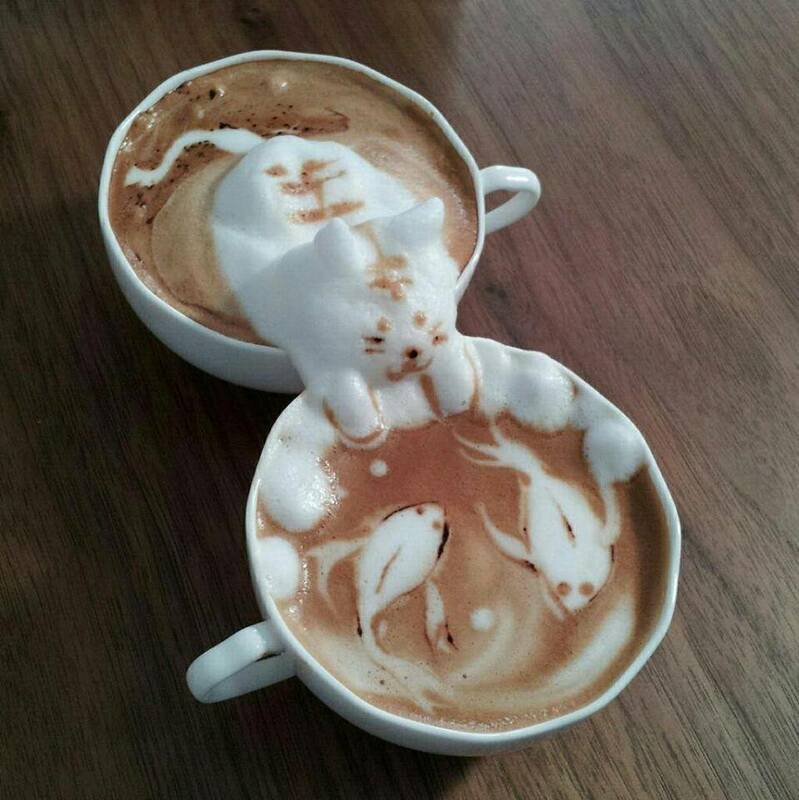 So, would you call this a Cat-puccino? Ha ha! Is that new kitten driving your older cats crazy? Friend of Cat Faeries, Aldyth Beltane of All Creatures Healing Network in San Francisco places kittens in foster care until they are old enough or socialized enough for their forever home. Recently we talked about how those rambunctious kittens can drive older cats to a meltdown. Multi Cat Household to the rescue! It’s all about acceptance, tolerance (oh boy, you can say that again), giving space when it’s needed, not feeling your space is encroached upon, feeling that family bond, and chilling out from just about anything which annoys the modern housecat. The other thing you can do is install as many Comfort Zone with Feliway diffusers as budget permits. The feline delighting pheromone spreads calm and friendship throughout the house as well as buys you insurance that someone won’t start peeing outside of the box. Happy Spring! And hey: spay, neuter! Aldyth tells us that every year, it’s the same thing… far too many kittens are being born with few homes ready or able to take them and love them. Come on! Spay! Neuter! Donate to your shelter so they can help pay for spray/neuter for people who can’t afford it. Let’s solve this problem! PS – you can tire out kittens with our cat toys and allow those older cats do get their beauty rest in peace! Which air cleaning houseplants are safe for cats? Spring time has me cleaning, rearranging, and thinking of planting air purifying house plants. But are they safe? NASA among others have done extensive research on common houseplants which can remove toxins which are unfortunately common in many US homes. Let’s keep disease causing cooties to a minimum! Plants are our friends! However when Cat Faeries reviewed the lists of air cleaning plants which are considered to be the most effective we were disappointed to see that many of the hard workers are deadly toxic to cats. NASA came up with their top 10 list of the best air cleaning plants. But nearly all of them are toxic to cats. But don’t despair, we’ll tell you what’s safe. Also just about any safe houseplant will help keep your air fresher and safer. With that tiny list, kitty can chew on them while they rid of your home of evil toxins like Benzene and formaldehyde. We learned that “air plant” Tillandsia species are epiphytes (also called aerophytes or air plants). They normally grow without soil while attached to other plants. Epiphytes are not parasitic, depending on the host only for support. We like them because they are so crazy looking! And the containers you can put them in are really fun, you can get very creative. 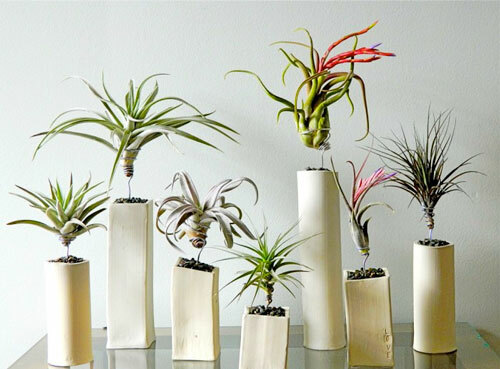 Many shops which carry Epiphytes (air plants) also carry succulents – note that many are toxic, so stick with Tillandsia. The air cleaning plants that NASA likes, but which aren’t safe for cats, would be suitable in your work place (if it’s not in your home and where cats and dogs aren’t allowed). Here’s a list of plants to cats, including outdoor plants. Worried that your cat has been poisoned with any substance? Call the ASPCA hotline 24 hours a day, from anywhere in the US – but note, there is a fee: 888-426-4435. This is a list of safe houseplants – many are not on the top 10 list of air cleaning plants but any plant will help keep air cleaner. But be aware that most of the plants are not safe for cats. A few are not safe for dogs, and a few are not safe for children. We have given you the short list if you don’t want to read up on your own. For a home as free of toxins as possible put a plant or two in the kitchen, near the fire place, the bathroom, and in all bedrooms. And while you are at it, ditch the carpet which is a nasty brew of countless toxins – consider that your cat is just a few inches taller than carpeting and is breathing it in at a faster rate than you are. Besides, what’s lovelier than hardwood flooring, with perhaps a handmade cotton scatter rug? Carrageenan is a common thickener and emulsifier used in industry to improve the texture of ice cream, yogurt, cottage cheese, soy milk and other processed foods. It also is in many canned cat foods. This all too common food additive is extracted from a red seaweed, Chondrus crispus, which is popularly known as Irish moss. Carrageenan, which has no nutritional value. And for people, Andrew Weill, MD doesn’t like it either!